It's never easy entering a market segment brimming with a number of established players, but Asustor has proven that there's room in the NAS arena for relative newcomers. The Asus subsidiary was founded in 2011 and has since become a viable alternative to popular units from the likes of Qnap and Synology. What's the recipe behind Asustor's success? The company claims to be "devoted to providing the world with unparalleled user experiences," and a team of over 80 employees has succeeded by creating a product range that mirrors a lot of what's on offer from the competition. And that's no bad thing. 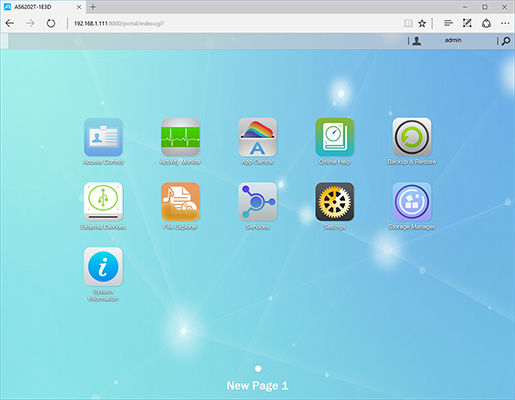 Qnap and Synology have led the way through years of storage innovation, so it makes perfect sense for Asustor to replicate a number of features that have proven popular with end users while adding a sprinkling of extra innovation. One of the company's latest solutions is the AS6202T. 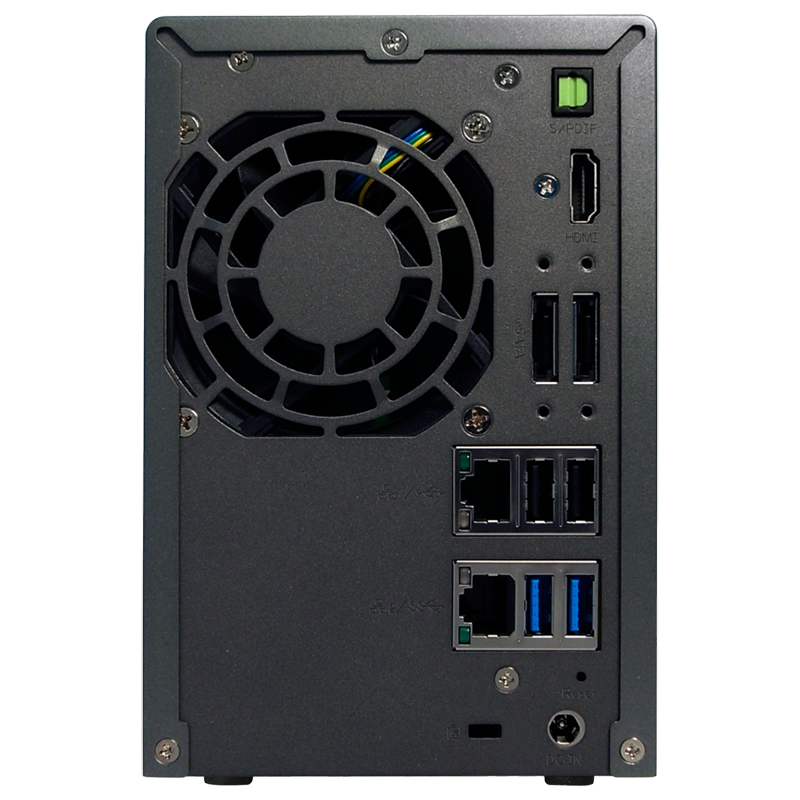 Priced at around £350 for a diskless model and aimed at power users or small businesses, this dual-bay unit touts a quad-core Intel Celeron processor and 4GB of DDR3 memory. The price point is at the upper end of dual-bay NAS solutions, and if you're seeking greater capacity, a four-bay alternative, dubbed the AS6204T, is available for £540. Both units ship with the same internal hardware and memory is expandable to 8GB should the need arise. 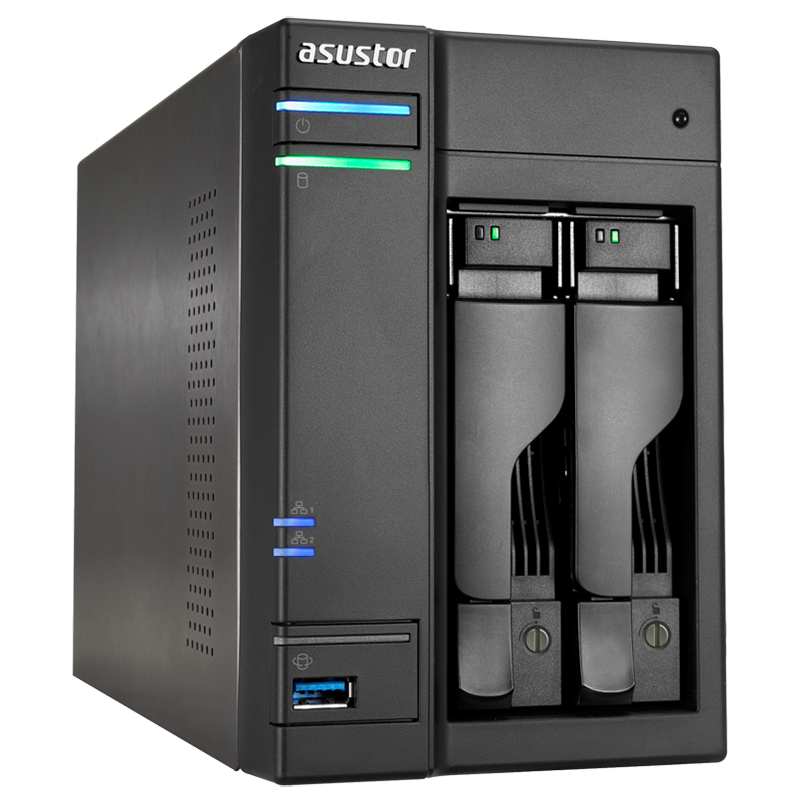 Asustor's dual-bay chassis hasn't changed a great deal - the AS6202T looks remarkably similar to 2013's AS-602T - but port selection has been expanded. 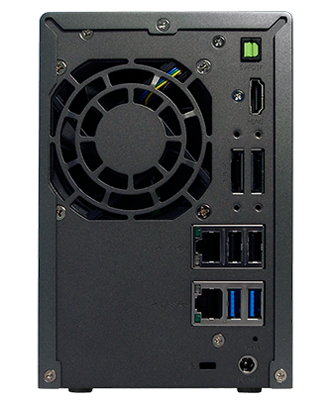 The front of the device is home to a single USB 3.0 port with one-touch copy, while around back you'll find S/PDIF and HDMI outputs for direct multimedia playback, a pair of eSATA for storage expansion, dual Gigabit Ethernet with support for link aggregation and a further four USB ports (2x 2.0, 2x 3.0). Another notable external addition is that the drive trays are now lockable by turning a small screw positioned alongside the eject button. Build quality is decent throughout, with Asustor's 164mm x 108mm x 230mm chassis employing metal drive-trays lined with sound-dampening material that helps soak-up drive vibration. Four rubber feet keep the unit firmly planted and the single rear exhaust fan runs quietly enough for the unit to go largely unnoticed. Installation, as you'd expect from a modern NAS, is as simple as following an on-screen wizard that applies the latest software update, configures the storage volume and creates an administrator account. Once complete, the user is dropped into a web-based admin panel dubbed ADM (Asustor Data Master) that closely resembles rival solutions. Synology's DSM is in our estimation more refined, while Qnap's QTS tends to have the largest catalogue of features, but ADM should look and feel familiar to users of either system and carries many of the features you'd expect. 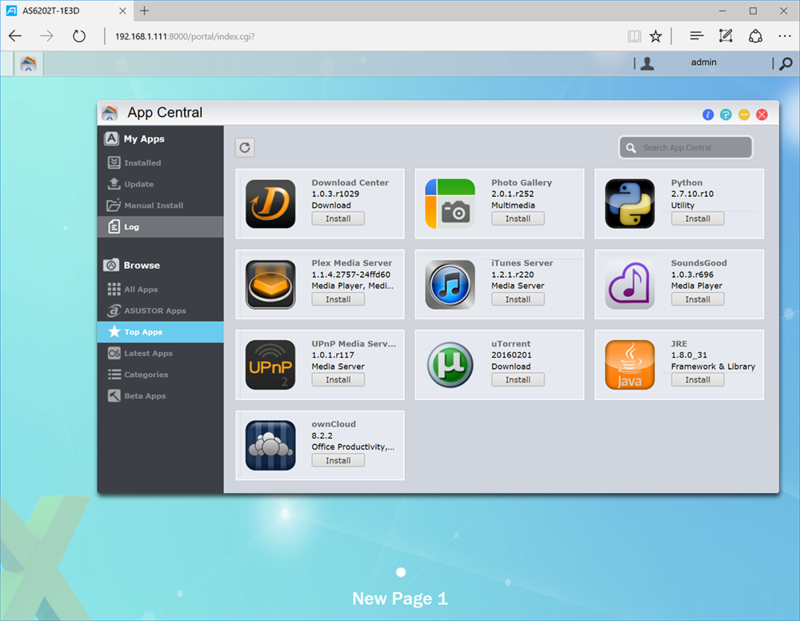 The home-screen layout resembles that of iOS, with shortcuts to various apps laid out across multiple pages, and the taskbar up top enables Windows-like multi-tasking. ADM's intuitive layout runs quickly on the underlying hardware and there are a myriad of features for power users to play with. The highlights include support JBOD, RAID 0 and RAID 1 volumes with online RAID level migration, comprehensive backups solutions including remote sync, cloud, external and FTP, support for Windows ACL, iSCSI targets and even virtualisation. Print, download and UPnP media servers are of course available, and the built-in app depository offers a good selection of multimedia functions. The Asustor Portal offers big-screen access to popular services such as Netflix and YouTube, there's Kodi integration with support for up to 4K video output via HDMI, and the AS6202T comes bundled with a small remote control to help navigate between services when a keyboard and mouse isn't convenient. In terms of customisation, Asustor covers all the essentials. The NAS can be made to turn on or off based on a user-defined power schedule, the disks enter standby after a period of inactivity, fan speed can be customised to your preference and there's also an option to dim or turn off the LEDs lining the front of the device. It's a powerful box, but one area in which today's best NAS solutions are arguably lacking is in smart-home integration. It can only be a matter of time before the likes of ADM, QTS and DSM begin to integrate with popular home automation services such as IFTTT, Philips Hue and Amazon Alexa. Should you choose Asustor's offering over, say, a Qnap or Synology? The trio is becoming hard to tell apart and for most it will be a case of personal preference. The best way to get a feel for Asustor's ADM operating system is to try out the live online demo, and if you still need convincing, note that the AS6202T is backed by a three-year warranty as standard.